An Artist's Journey to Bali is much more than your usual travel guide to the beautiful and mysterious Indonesian island of Bali. Written and illustrated by renowned artist Betty Reynolds, this Bali travel guide contains the author's original watercolor art depicting the wonderful island whose inhabitants are known to adhere to daily rituals that, although unfamiliar to foreigners, give the island and its people a distinct aura of mystery and magic. In this beautifully illustrated artist's sketchbook, the author shares her good fortune of meeting many Balinese who allowed her to witness important aspects of their lives and culture, and to participate in the religious rituals that mark their passage through the major stages of life. If Bali travel is in your future, this is a great book to have. It takes you right into the Balinese culture, exploring Balinese art, unveiling the traditions and spirituality in that part of the world. 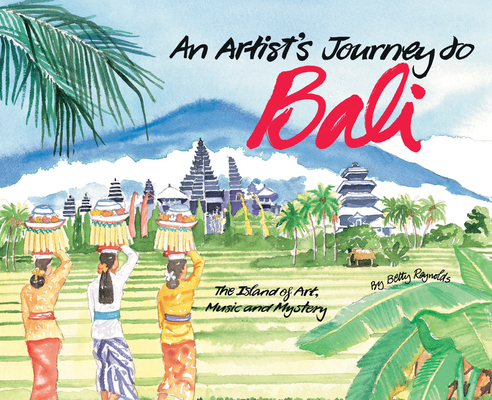 Take a rare journey to a beautiful place, as Betty invites you to experience it with An Artist's Journey to Bali. Betty Reynolds left a career as a creative consultant and advertising art director to accompany her husband to Asia. They first moved to Singapore and then Tokyo where they lived for seven years. She now divides her time between Philadelphia, PA and Orcas Island, WA but her heart remains in Japan. Other Tuttle books by Betty Reynolds include Tokyo Friends, Japanese Celebrations, and Squeamish About Sushi.